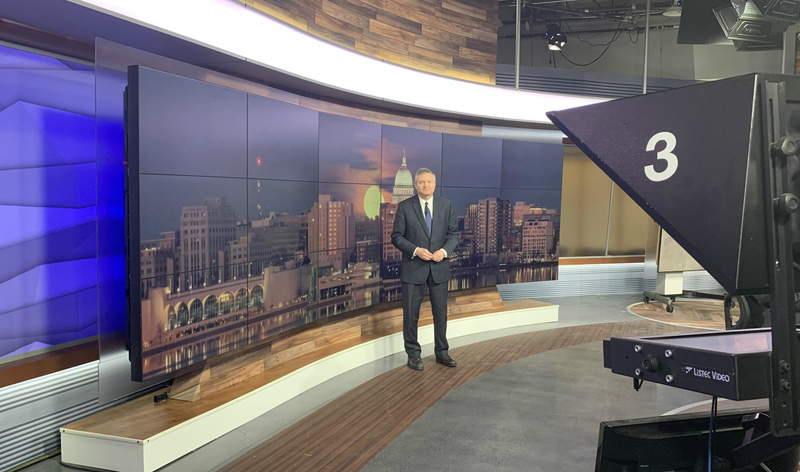 WISC, the CBS affiliate in Madison, Wisconsin used Super Bowl Sunday as the perfect moment to unveil a station transformation including new branding, set design and motion graphics. 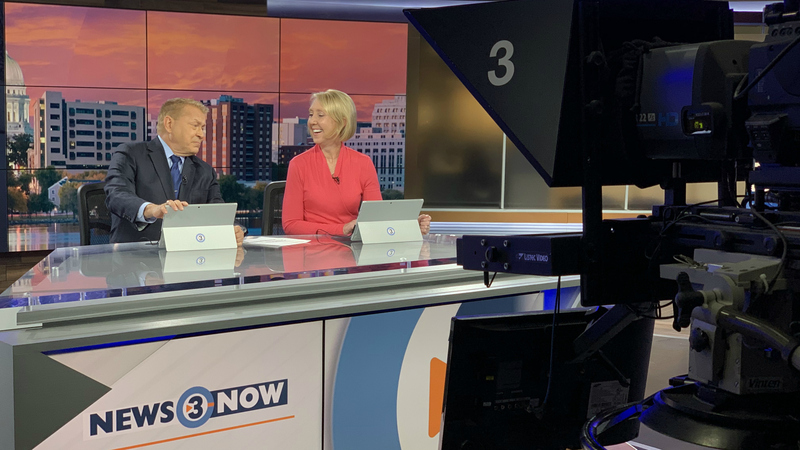 Rebranded as News 3 Now, the Morgan Murphy Media station will continue to utilize its unique Channel 3000 sub-branding for its online presence and Alert Center. Visually, the station’s new logo design is aimed at connecting online and on-air, with the station noting the reference to a play button in the design. “Those who are graphic-design inclined may notice the ‘C’ shape in the circle as well as the ‘play’ button, both visual representations of our digital presence,” notes WISC in a release about the upgrade. In the studio, Devlin Design Group has delivered an intimate new home for the station stocked with technology and local touches. “Storytelling is the foundation of what we do. With the new design, our talent and viewers are now able to engage deeper with our story content,” said Colin Benedict, Morgan Murphy Media’s VP of News. 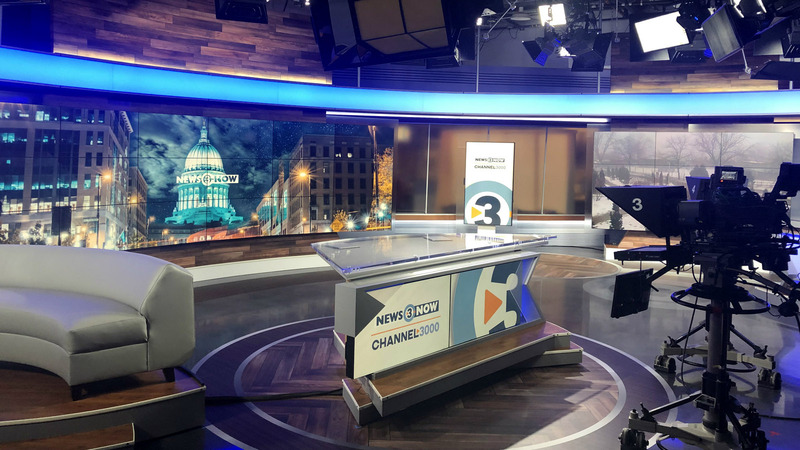 With views into the newsroom and plenty of room for flexibility in coverage, the News 3 Now set includes a complement of zones centered around an eighteen-monitor, 6×3 video array behind the anchor desk from Digital Video Group. 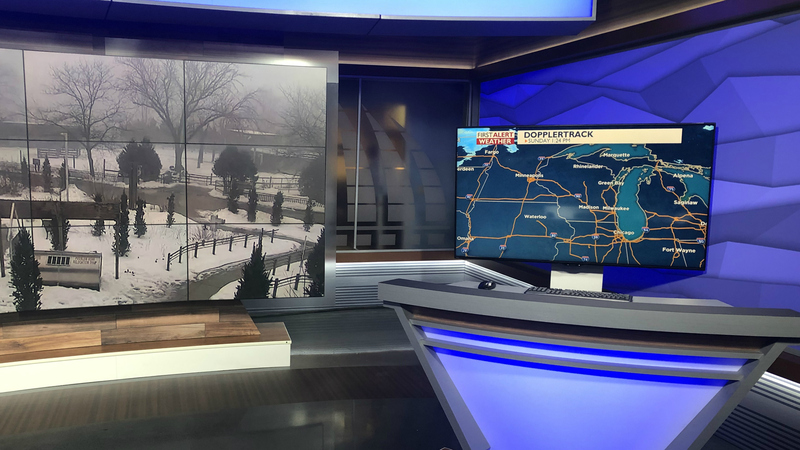 The desk, which also includes monitors for branding, follows the new station identity, framing its graphics monitor with a notch on the right side and another play-button shape overlapping the monitor on the left. The weather center, located to the right of the home base, includes a 3×3 array that is also shared by reporters for stories and debriefs while a 70″ mobile monitor cart provides flexibility. To add local character, the set includes an abstract angular water pattern in the backlit walls, which, Devlin notes, represents Madison’s nickname as the Four Lakes City. The etched glass surrounding the weather center also ties into the local community with an abstract shape representative of the Wisconsin Capitol building in Madison. “By using technology in creative ways, it allows the team at WISC to really be in touch with their viewers through enhanced storytelling. We are happy to partner with them on this set design project with an eye on the future,” said Kartik Dakshinamoorthy of Devlin Design Group.